There have recently been protests in many parts of Spain against foreign tourism artificially raising the price of accommodation, making nights unbearably noisy, debasing tradition ...We really are the most fortunate of the Fortunate Isles, as the Canaries were once called: we have virtually no tourism, and certainly no massive tourism with hordes of drunken hooligans. Why not? The most obvious reason is that El Hierro does not have those things that tourists really expect, not what people profess to want. We have no beaches to crowd with rented loungers; no little Englands complete with pubs, tandoories and fish-and-chips; no ‘vibrant’ night life; no souqs with the suggestion of poverty hidden just round the corner; no quaint bougainvillea-bedecked piles of white cottages; no exotic fruit split open by spectacular machete-wielding bronzed gods … El Hierro only has its unique beauty, varied and condensed into a few square miles emerging from the ocean. It has peace and unpolluted air – you can even see the Milky Way at night. It has, or could have, everything that makes for a real holiday. The second most obvious reason is the cost of getting here. For example, a regular return flight from London to Tenerife in October (not especially high-season) last year would have cost you from 92€, BUT a return flight on the same dates from Tenerife to El Hierro would have cost you 118€. Residents in the Canaries have a 75% subsidy on inter-island flights. Please come to your own conclusions. Thirdly, the island has never been promoted, sensibly at least. Few visitors believe the official blurb proclaiming the excellence of our ‘rich folklore’, ‘traditional craftsmanship’, ‘diverse cuisine’, ‘inimitable wines’ … If they do, they soon enlighten their friends when they get back home. And I don’t think the condescending articles by travel writers help much (1). At one time there were offers to develop hotels, spas and so on from private investors. Our authorities quickly, and rightly, saw that the islanders would not put up with it and the projects were scrapped. In their place we promoted ‘quality tourism’, i.e. big boots and little woolen socks that consumed sandwiches (one a day made with half a roll of bread and two slices of cooked ham bought in a supermarket). Eventually we must have understood this kind of tourism went no way even to cover the cost of maintaining the ancient public footpaths crisscrossing the island. Recently, the idea has been revamped and, additionally, we now cater for bikers (hired mountain-bikes), long distance swimming and cross-country running. 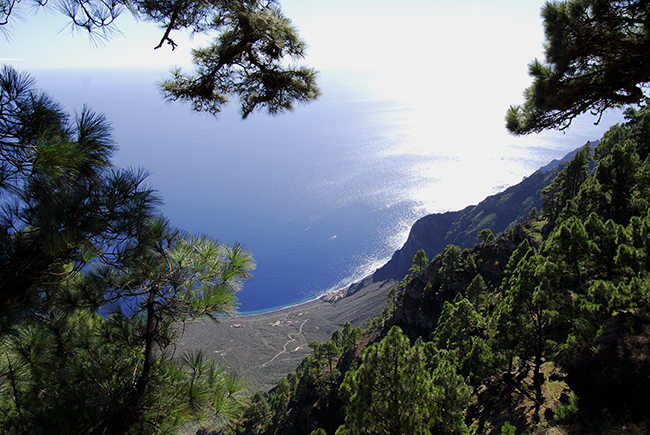 The area known as Las Playas seen from almost a thousand metres above in the pine forest near El Pinar. The building on on the coast in the centre of the photo is the Parador. Then, of course, there are the questions of where to lodge the tourist and things for him and her to do. There are two or three very nice small hotels, some boarding houses and a very agreeable ‘Parador’ – state-run hotel. Quite simply insufficient if this is a sector to be developed. Some years ago I investigated setting up a ‘casa rural’. I came away with a fly in my ear convinced that it was a closed shop set up by and for a chosen few. Now there seem to be quite a lot of ‘casas rurales’ so things must have eased up considerably. And a new figure: "VV" - Holiday Home - a sort of casa rural which is not quaint. As for things for the tourist to do there is very little available at present. But the municipal and island authorities are at last waking up and beginning to recognize and encourage private initiative. There are of course things in this sector that are already working. And others that are beginning to surface. Scuba diving (that was not a joke) at La Restinga is perhaps today’s major single attraction to the island. Paragliding from the spectacular heights above Frontera is becoming more popular. So far we have indeed been lucky. The wait-and-see attitude of the islanders has paid off and preserved us from the terrible effects of the tourist industry’s insatiable appetite. Now we have to sit down, put aside vested interests and decide about the future; how to use what we have – our forests and protected areas, our coastline and waters, our weather, our mountains, … There are hopeful signs: the lighthouse at Punta de Orchilla, at the deserted westernmost point of the island, may be converted to a luxury hotel; winemakers are promoting visits to wineries and restaurants are taking gastronomy more seriously; there is talk of converting the island into a sort of organic oasis, etc. And then there are future oportunities for development that have hardly been considered yet. The island would be ideal for "residential tourism" especially for the retired, and also for specialized health centers, creative hubs ... Such things, though, require political and financial involvement.